American infantry, led by the 115th and 116th regimental combat teams of the 29th Infanty Division, pushed to within one mile of St. 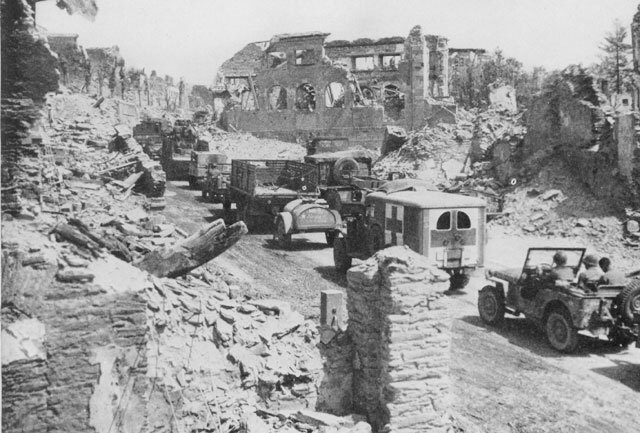 Lo, France, a crossroads city that would become known as The Capitol of the Ruins for the utter destruction leveled on it in the war. 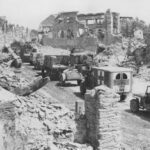 The 104th medical battalion went into the line with the combat units; they performed emergency surgery within a half mile of the fighting and sustained more casualties among the medics and doctors than the tank and artillery units nearby. The teams reached the ridge at Martinville, east of St. Lo, and the hamlet of La Luzerne, northeast, but were stalled in sight of the city, where they would fight in place until July 18.